Apple iPhones are one of the best selling smartphones in the world and offer much better battery life compared to Android smartphones. However, this is not always enough and portable chargers for iPhones are must haves for travellers, commuters and even general users. The good news is that iPhones generally have smaller batteries compared to Android smartphones and your power bank for iPhone will provide more full recharges to the iPhones when compared to Android smartphones. Small screen iPhones (iPhone 8, 7, 6S, 6 etc.) have battery capacity of less than 2000 maH while Android smartphones come with 3000mAH or higher battery. The latest big screen iPhones (XR, XS, XS Max, X, 8 Plus) are comparable to Androids such as Samsung S10, S9, S8 etc. in battery capacity (about 3000 mAh and higher). The 2018 released iPhone XS Max, iPhone XS, iPhone XR and 2017 released iPhone 8, iPhone 8+ and iPhone X are the only Apple smartphones that offer 18-watt fast charging over USB-C PD (Power Delivery). This means that you can charge your iPhone XS Max, XS, XR, 8, 8 Plus and iPhone X from 0 to 50% in just 30 minutes using a compatible USB-C PD powerbank or wall charger. However, the stock 5-watt wall charger that Apple ships with iPhone XS/XS Max, XR/X/8/8+ does not offer fast charging. A fast-charging compatible USB-C to Lightning cable. We recommend Anker’s recently launched Powerline+ II USB-C to Lightning Cable or Apple’s own USB-C to Lightning cable. A wall charger or powerbank that can deliver 18 or more watt over USB-C PD. Apple’s lowest cost USB-C PD wall charger is often out of stock. Two good 18+ watt USB-C PD wall chargers that are much lower priced than Apple USB-C PD 18 watt wall charger are Anker Powerport PD2 dual port USB-C PD wall charger (recommended) and Aukey PA-Y10 56.5 watt USB-C PD charger, Of course, you can also use Macbooks’ 29 watt, 61,watt or 87-watt wall chargers for fast charging your iPhone 8, iPhone 8+ & iPhone X. Older iPhones such as iPhone 7, 7 Plus, iPhone 6, 6S, 6S+, 5, 5S, SE do not support USB-C PD fast charging. Instead, older iPhones (7, 7 Plus & earlier) support maximum charging speed with 2.4 amp current. In February 2019, Anker released its much awaited USB-C PD powerbank in compact 10000 mAh capacity. The Anker PowerCore 10000 PD has instantly become our top recommendation as best fast charging powerbank for iPhone XS Max, XS, XR, iPhone 8/8+/X due to its extremely compact size, weight and build quality superior to any other competitors. 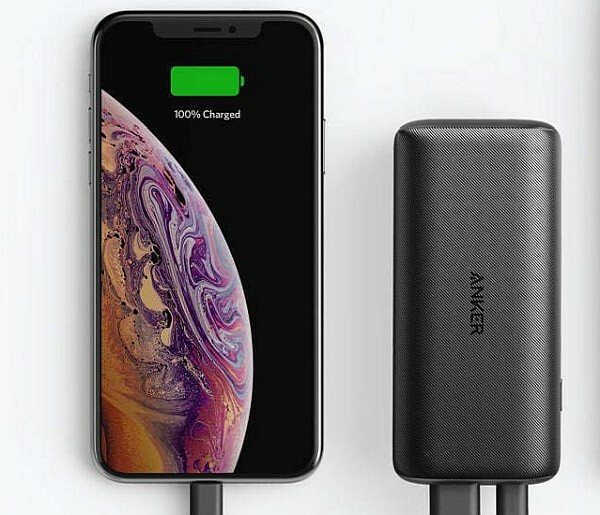 Anker PowerCore 10000 PD has two charging ports: one USB-C port with max output of 18-watt for charging latest iPhones XR/XS Max/XS/X/8/8+ etc. 0 to 50% in 30 mins and a standard 2 amp maximum capacity USB port. The great thing is that you can use both ports at same time at maximum speed, meaning you can charge your new iPhone XS and older iPhone 7 from the same tiny powerbank at maximum speed! 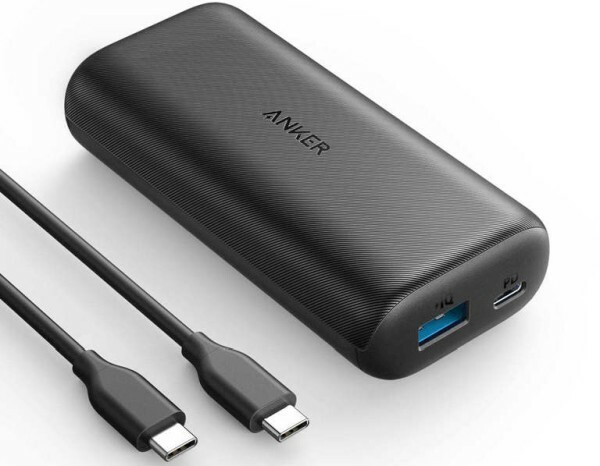 Anker PowerCore 10000 PD will also fast-charge most Android phones including Samsung Galaxy S10, S9, S9+, S8, S8+, S7, Note 8, etc. at their fastest charging speeds (18 watt or Quickcharge 2.0 equivalent). You can recharge the PowerCore 10000 PD in just about 3 hours using a 18-watt USB-C PD wall charger. You can also use the new iPad Pro or Macbook adapters to fast-charge the powerbank as well. We recommend Anker Powerport PD2 30-watt dual port wall charger for fast-charging this powerbank and your iPhone XS Max, XS, X, XR and 8, 8 Plus. PowerCore 10000 PD will give about two full recharges for the iPhone XS Max, iPhone XS, iPhone XR, iPhone X and iPhone 8+ and three full recharges with some charge to spare for the iPhone 8, 7, 6 etc. Two ports with 2 amp support from second port makes it Anker’s lightest powerbank with two ports. The powerbank is 1-inch thick. A slimmer design would have been better. Anker PowerCore Speed PD is our top recommendation as fast charging powerbank for iPhone XS Max, XS, XR, iPhone 8/8+/X. This sleek and compact high capacity portable charger comes bundled with a high quality 30-watt USB-C wall charger. The powerbank has two charging ports: one USB-C port and a standard 2.4 amp maximum capacity USB port. 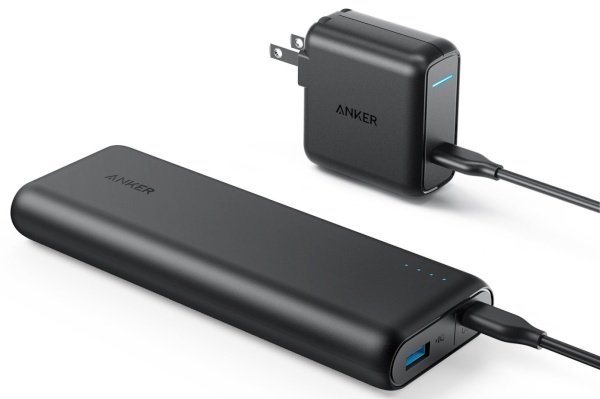 Anker PowerCore Speed 20000 PD has a maximum USB-C PD output of 22.5 watt. This means it will also work as a charger for Nintendo Switch (which requires 18-watt USB-C PD). It will also charge Samsung Galaxy S9, S9+, S8, S8+, S7, Note 8, etc. at fastest charging speeds (18 watt or Quickcharge 2.0 equivalent). While the price of the Anker PowerCore Speed 20000 PD may seem high, the bundled wall charger which costs about $30 to purchase separately means that the effective price is same as Anker’s normal 20000 mah powerbanks. The bundled 30-watt USB-C wall charger allows you to fast-charge your iPhones directly which is no doubt very handy. The bundled wall charger will also work excellently as a Nintendo Switch charger or Macbook charger. The PowerCore Speed 20000 PD can be recharged using the bundled charger in just 4 hours. The power bank will give about four full recharges for the iPhone XS Max, iPhone XS, iPhone XR, iPhone X and iPhone 8+ and six full recharges for the iPhone 8. Anker PowerCore+ 26800 PD is our top recommendation as fast charging powerbank with bundles USB wall charger and with highest TSA-allowed capacity for iPhone 8/8+/X. 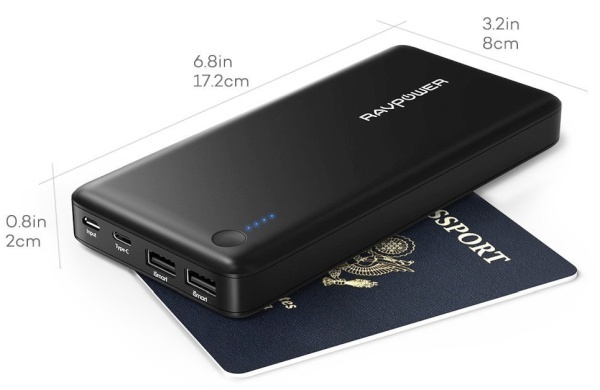 This massive capacity powerbank has three charging ports – one USB-C port and two standard USB ports. Anker PowerCore+ 26800 PD has a maximum USB-C PD output of 30 watt, which makes it a perfect charger for Macbooks and iPads. Its 30 watt output is also more than adequate for Nintendo Switch (which requires 18-watt USB-C PD) and it can the Switch while it is being played. Anker PowerCore+ 26800 PD will also charge all latest Samsung smartphones such as Galaxy S9, S9+,S8, S8+, S7, Note 8, etc. at their fastest charging speeds (Quickcharge 2.0 equivalent). The bundled 30-watt USB-C wall charger allows you to fast-charge your iPhone XS Max/XS/XR, iPhone X or IPhone 8/8 Plus directly as well. The Anker PowerCore+ 26800 PD can be recharged using the bundled wall charger in just 4.5 hours. RavPower 26800 PD powerbank is our choice as best fast charging powerbank for the new iPhones if you already have a USB-C wall charger or want to use your existing USB wall charger. This powerbank can be recharged using any standard USB wall charger in about 12 – 14 hours. You can also recharge it with any USB-C PD 30 watt wall charger in 4 to 4.5 hours. This selectable dual charging feature makes this powerbank more versatile than Anker USB-C powerbanks which can be charged only by using USB-C cables. RavPower 26800 PD powerbank has a maximum output over USB-C PD of 30 watt. This makes it an excellent choice if you happen to need a powerbank for your Macbook or ultrabook as well. Both these powerbanks have three charging ports – one USB-C and two high speed USB ports. An option with bundled USB-C wall charger would have been great. RAVPower Luster Mini 3350mAh is the smallest powerbank that you can find for iphones. We think that this lipstick sized powerbank is better than Anker 3350 as it has battery indicator lights and a non-rolling design. The 1 amp charging speed of RAVPower Luster Mini 3350mAh is equivalent to Anker 3350. It will charge almost all iPhones – 8, 7, 7 Plus, 6, 6S, 5 etc. one time. The RAVPower Luster Mini 3350mAh is available in 3 colors that match iPhone’s style. 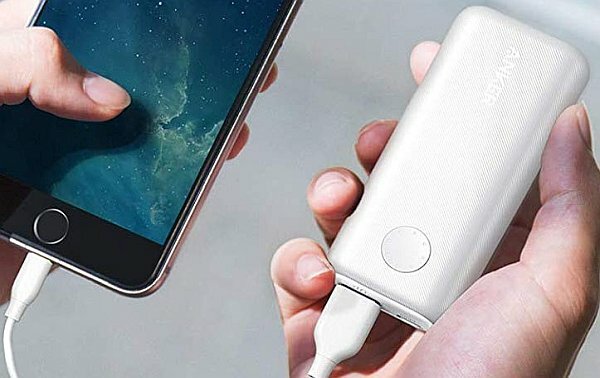 If you are looking for an ultra-light powerbank for your iPhone that will slip in your pockets and handbags easily you, look good, and also charge your phone fully two times, then Anker PowerCore II 6700 is the best option due to its small, grippy, robust, and ergonomic design, and support for fast 2.4 amp charging for iPhones. Anker PowerCore II 6700 will fully charge (zero to 100%) iPhone 7, iPhone 8 or iPhone 6s/6 two times. The charging speed is about zero to 50% in around 45 minutes. The PowerCore II 6700 is available in two colors – black and white with the white one being more expensive. Charges iPhone 7/8/6S/6/5/SE at fastest supported charging speed (zero to 50% in 45 minutes or 2.4 amp max). Also charges new iPhones (iPhone XR, XS, X, 8, 7, 6S, 6) at zero to 50% in 45-50 minutes speeds (2.4 amp max). Comes with a free micro-USB cable to charge the powerbank. Cannot be charged directly with Lightning cable used to charge iPhones. While travelling or commuting, it is difficult to keep track of, and pack all the charging accessories for your iPhone. An powerbank with built-in wall charger is very handy for such situations as it allows you to pack just one thing for the trip instead of two. RAVPower 2-in-1 6700 is our top choice for integrated two-in-one powerbank for iPhone 7, 6S, 6, and iPhone 8 etc. 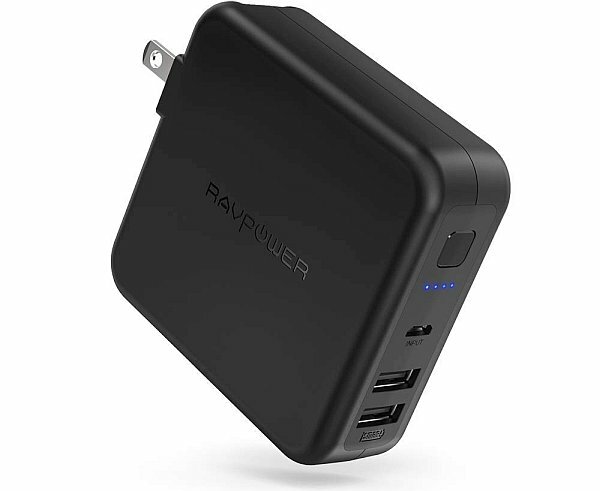 The RAVPower 2-in-1 6700 has all the features of a powerbank complete with 4 indicator lights and also doubles as a folding two-prong wall charger. The portable charger can charge iPhones at the maximum 2.4 amp speed which is the fastest charging speed for iPhones 7, 7 Plus, 6S, 6 etc. and earlier. RAVPower 2-in-1 6700 will charge iPhone 7, 7 Plus, 6S, 6, SE and 8 fully more than two times. The 4.5 inches x 2.7 inch x 1.1 inches powerbank weigh just 6.6 inches – much lighter than a wall charger and similar capacity powerbank. A charging case is the easiest and most convenient way to more than double the battery backup of your iPhone. The Alpatronix 3200 mAH charging case is the best iPhone case that we have tested so far. The Alpatronix 3200 mAH charging case fits both iPhone 7 and iPhone 8 snugly and hardly adds any bulk to the phone. It also supports all lightning headphones as well. The Alpatronix 3200 mAH charging case weighs just 2.7 ounces (80 gram) and is made from soft TPU material that is easy to grip. Best 10000 mAh powerbank for iPhone 7, 7 Plus, Iphone 8, 8 plus etc. Anker Powercore 10000. supports fast 2.4 amp charging for iPhones. Charges iPhone 7, 6S etc at their supported speed 2.4 amp. will also charge iPhone 8, 8+, X at 2.4 speed as well. Best High Capacity powerbank for iPhone 7, 7 Plus, Iphone 8, 8 plus etc. Sometimes we need as much battery capacity as possible for our phones. This is often the case during while travelling to remote areas, during long car rides, camping, or during emergencies. RAVPower 26800 powerbank is our top choice as heavy duty high capacity powerbank for iPhones. RAVPower 26800 powerbank has a true battery capacity of 26800mah – the maximum allowed by TSA on flights. It comes with three high-speed charging ports, which means that you can charge up to three devices at once from the powerbank – a great feature for families. The RAVPower 26800 powerbank supports 2.4 amp fast charging for iPhones 7,8,6S, 5 etc. The powerbank can be fully charged in 14 hours using 2.4-amp USB wall charger such as RAVPower dual 2.4 amp USB charger. The RAVPower 26800 powerbank has a scratch proof and sturdy build that is backed by RAVpower’s generous 30 month warranty. Price! – As a no frill powerbank that can charge iPhones 7/7 Plus/ 6S/6 at their maximum possible speed, it excellent value for money.